Red dead redemption 2 is has just been out for about 3 weeks and many out are wrapping out the story mission , wondering when Red Dead Online will be released.At recent Take-Two Interactive, the parent company of RockStar games, it was confirmed that the online component will be arriving later at the end of November 2018. Although no specific date was given, and Rockstar has pretty much gone quiet since the release of the Single Player. But at Take-Two call specifically it was said that the Beta which is how Red Dead Online is starting out would be launching towards “the end of the month”. It was also added by Take-Two President Karl Slatoff, that “Red dead online is an evolution of the classic multiplayer experience in the original Red Dead Redemption, blending narrative with competitive and coorporative game-play in fun new ways”. To me I think it’s interesting because they compare the multiplayer to Red dead redemption rather than GTA online. So, that was the big update a few days ago. 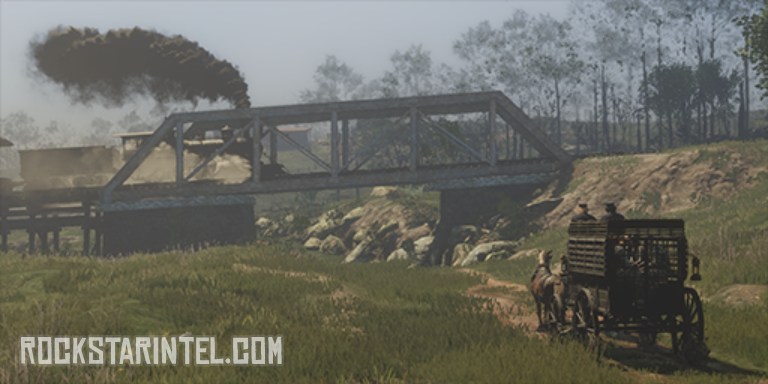 But now the first image from the online mode has been leak via RockStarIntel. The still image shows a cut scene from the introduction or first mission of a character being taken to jail in a prison wagon. This has taken place in Southern New Hanover. There’s a train in the distance that can be seen but there isn’t any too revealing for Red Dead Online leak, other than it confirms how things will start out. One of the mission for red dead redemption 2 single player is called “Break Out” and you get for completing the introduction for Red Dead Online, which make now make sense. Somehow, we’re going to break out and have to escape authorities and that’s when the online experience will truly begin. But right now everyone is asking what the online experience will be like, when it will be set, and will RockStar will gives us a true definitive date and reveal official information or footage about Red Dead Online. Why the online experience is taking so long? The obvious answer would be that Rockstar simply needed more time and are rushing to a deadline. Which makes me wonder if the Beta will drop the very last day of November 2018. Kotaku last month had whole piece speaking to employees about the work conditions at Rockstar Games, interestingly, employees told them that they’re crunching to finish the online mode in time.